How to share information from Box on Honey. How to share a Box file on Honey. Open up a new post by clicking the orange new post button at the bottom, righthand corner of your screen. Click the paperclip icon in the editing toolbar at the top of the page. Select Box from the dropdown menu. If you're already signed into Box, this will open up a file picker window. If you're not signed into Box, authenticate with your credentials to see the file picker. Choose the file(s) that you'd like to share on Honey, then click the blue Choose button. You'll see that these files will appear in your post. Then, add/edit your post title and post body to your liking. When you're ready to publish, click Continue at the top right corner of the page, select your groups, and click the blue publish button. You can, of course, also add a Box file to an existing post by editing a post and following steps 2-7. Details about Box files on Honey. 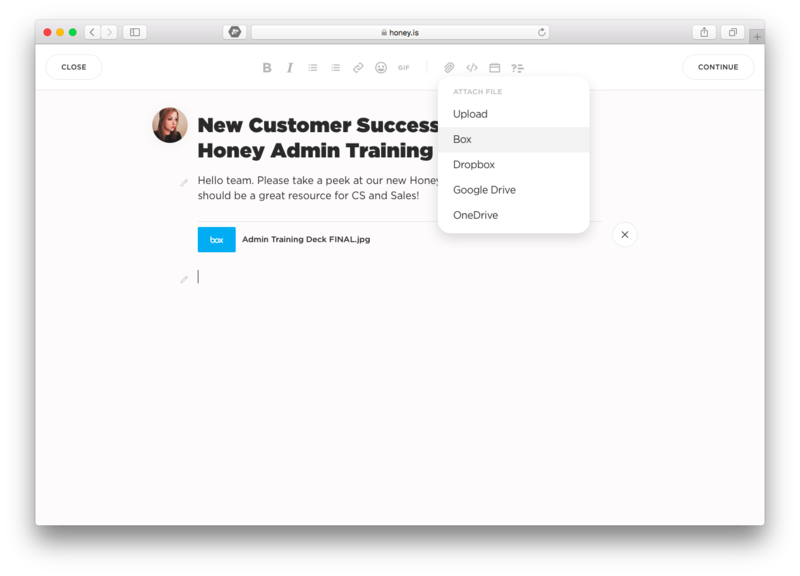 We love sharing files from Box because if the file is edited, the link is permanent. No worries about returning to your post to update the file — we'll always point to the latest version of the document behind the link. Hooray! You may notice that your file from Box doesn't embed like a file upload or a Google Drive document does. This is because Box doesn't allow us full access to your content, but instead only provides us with the sharing link.